← Hayward WI A-Lure-Of-Lights 2014-15 In The Works! Now that we’ve been hit with our first winter storm, my view from the tree stand has dramatically changed! Instead of the dull brown carpet of leaves, everything is blanketed in stark white. The snow certainly brightens up the landscape and makes it easier to see the wildlife in the woods, but now I can’t hear the deer coming! Before the snow hit, I always heard the deer moving through the crunchy leaves; the ‘chip, chip, chip’ of their hooves always gave them away. Now, I cannot hear them coming at all, unless an occasional twig snaps off as they move through the thicket. 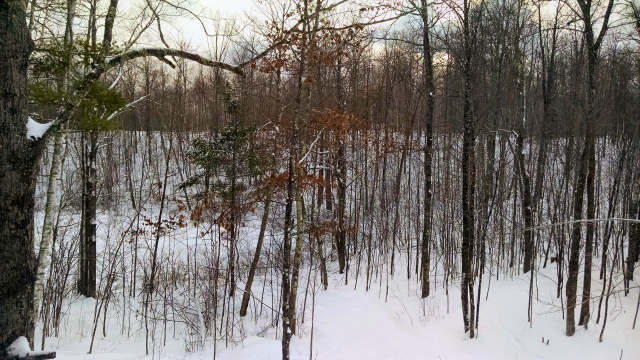 Yesterday my long trek to the deer stand was a challenge – the freshly-fallen snow was knee deep over the rolling terrain and it seemed to take forever to reach the food plot. The deer had pawed through the snow to reach the crispy frozen greens now buried deeply. It was interesting to see their tracks and trails through the woods. Unfortunately, the deer didn’t visit me yesterday while I was in the stand, so I’ll have to try again tonight. This entry was posted in Hunting, NORTHWOODS LIFE, Scenic Observations and tagged bow hunting hayward wi, deer hunting hayward wi, snow in hayward wi, winter in hayward wi. Bookmark the permalink.